Last week we got off to a good start. About 20 people showed up on what turned out to be a perfect weather day for a Sunday Long Run (on Saturday). The temps were moderate, the air was dry, and the distance was manageable. Later that night it was good to see everyone at the MRC Summer Party looking no worse for the wear… they actually looked better off since they didn’t have to get up early to run in the morning. This week we’ll be back at Brueggers at 8AM to step up the distance and take on Spot Pond. The half run is about 7 miles, the full about 12.5, your GPS distance may vary (actually guaranteed to vary so don’t complain). Generally each pair of weeks the long run will step up 4 miles and then drop down 2 miles the following week as we walk to 22 miles. Meanwhile the short run will step up 2 and then step back 1 headed towards an 11 max before the race. Leaving Brueggers we will head south on Main Street (in the direction of Malden), past Dunkin Donuts, and turning right on West Wyoming… like the start of the MRC Summer Route. Wyoming will take you to Grimsby’s where we’ll turn left onto the Fellsway East. Welcome to the two hills you’ll learn to love on the Fellsway East. This will be your first of many visits this summer. After you cross through this hilly section of the Middlesex Fells you’ll go through a set of lights and come down to a traffic circle in Medford where you’ll turn right on to Highland Ave. Follow Highland up towards Spot Pond, finding a water stop on the left right before a rotary by the Flynn Rink. After the water stop the long runners will turn left at the rotary on to Elm Street. The short runners will stay straight on to Woodland Road, running past the Flynn Rink. Follow this to the construction zone at Pond Street where you’ll turn right and head down a steep hill to Grimsby’s. Turn left there and follow the Lynn Fells past Melrose High School, after which you’ll turn right on Melrose Street and a quick right onto Main Street to finish up at Brueggers. Lond Runners run to the end of Elm Street and turn right onto the Fellsway West. This will bring you through another portion of the Middlesex Fells, crossing under I-93, past the Sheepfold, and over I-93. Watch on your right as you cross an off ramp from I-93, cars come down there very quickly! After that you’ll want to turn right into the Straw Point parking lot. There may be a water stop there, if so grab some water, if not keep going through the parking lot to Pond Street, continuing right to keep circling Spot Pond. Pass the Zoo, continuing straight as Pond Street becomes Woodland Rd, up to Flynn Rink, through the rotary and back to the water stop at Highland Ave.
After this water stop you’ll cross Highland and take your first right on East Border Road. This will bring you up to a set of lights where you turn left to get back on the Fellsway East. Ride those two hills back past Grimsby’s onto the LynnFells Parkway. Run past Melrose High School, turn right on Melrose Street, and a right on Main Street which will take you back to Brueggers. Water stops, I’ll handle the Highland Ave stop, I think Hank will be at Straw Point, and if anyone else wants to help feel free to stop by. I may chose to run around Spot Pond. If I do, remember where my car is because you may have to help yourself. Those are the plans, who’s in? Roll Call! It’s time to get the Sunday Long Run started! Join us at 8AM Saturday July 14 for the first run of the season. We’ll be running Saturday since the Melrose Running Club Summer Party is Saturday Night. New to this? Here’s how it works. We meet at Brueggers, collect $2.00 from those running the long run, $1.00 if you’re running short. Start the run. Each week there will be water stops about every three or four miles. The stops are there for a quick drink and a little snack if you need it. As the runs get longer (>14 miles)there will be gu around miles 7 and 14. If you need anything else you should practice carrying it for race day. 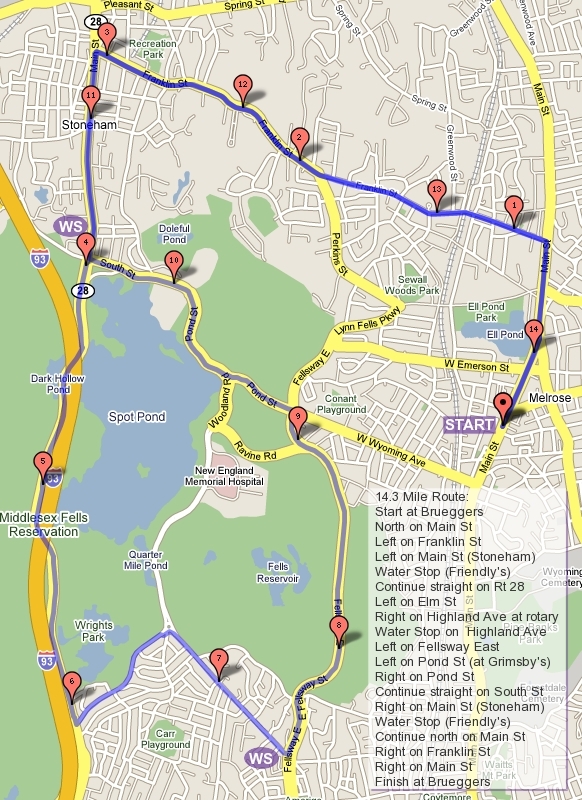 The program is about 15 weeks, aiming for the Baystate Marathon. TO train for a half you should already be able to run 5 miles comfortably and regularly. For a marathon your typical long run should already be a comfortable 10 miler. If you’re training for a different race at a different time in the fall, tailor your distances around existing water stops. Maps for the run are located on the MRC SLR blog main page and turn by turn directions can be accessed from water stop to water stop on your smartphone by clicking the link below. Learn the routes please. If you wander of the route we won’t find you… because you’re lost. This week’s run is short and sweet. We’ll head north on Main Street, bear right on Green Street and turn on the Lynn Fells Parkway. Follow that to the first set of lights where you tune left. Running short, you’ll turn left on Howard, back to a left on Green, merge back to Main and finish at Brueggers. Long runners will continue on Main Street in Saugus which will become Farm Steeet in Wakefield. Look for a water stop at Wakefield High School. Continue on Farm to a left at the end onto Water Street. This will bring you to Wakefield Center where you turn left on Main Street which will bring you back to Melrose and Brueggers. After the run feel free to change into dry clothes and buy a bagel and a drink. Brueggers has graciously hosted us for a dozen years now, please respect their business! That means keep quiet before the run, get clean after the run, and patronize their business. Please refrain from bringing outside food in to their business. Lastly, please respond to the blog post so I know you’re coming. The head count of people in for the full or half determines the amount of supplies at the water stop. With that, it’s time for the Roll Call! Who’s in for the first run of the 2018 Fall training season? !